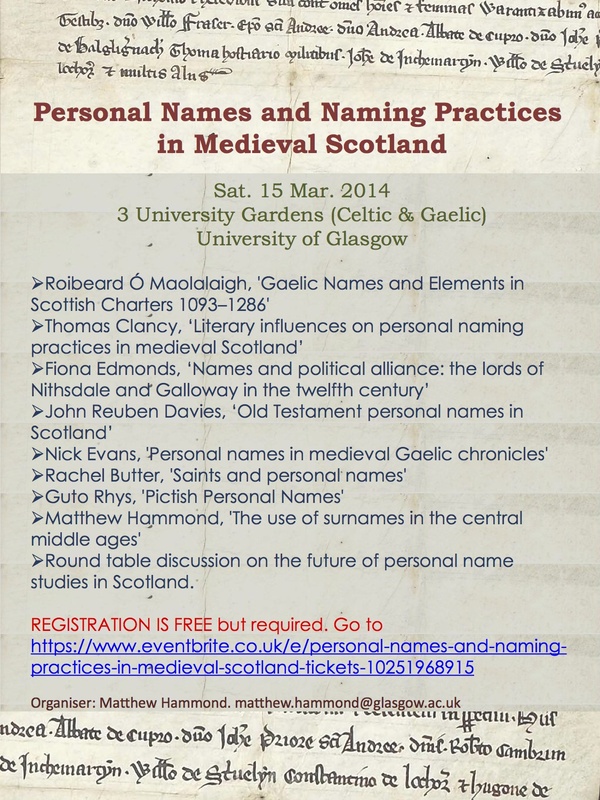 On Saturday 15th March, the ‘Personal Names and Naming Practices in Medieval Scotland’ day-conference will take place in the University of Glasgow. The event will begin at 9am and finish at 5.30pm, and is being held in 3 University Gardens (Celtic & Gaelic). Sponsored by the Centre for Scottish and Celtic Studies, it will consist of a day full of interesting papers on personal names in medieval Scotland. This will be followed by an open-ended (and wine-fuelled!) round-table about the future of personal name studies in Scotland. This discussion will not just concern the middle ages but a more general theme of anthroponymy, and we hope that everyone will join in! The list of confirmed conference papers and the poster for the event can be found below. This entry was posted in News and Announcements by Alice. Bookmark the permalink.